Martin Truex Jr. won Sunday’s NASCAR Cup Series race at Charlotte Motor Speedway. Truex’s Furniture Row Racing No. 78 Toyota led 91 of 337 laps, the fourth of 10 playoff races for the series. 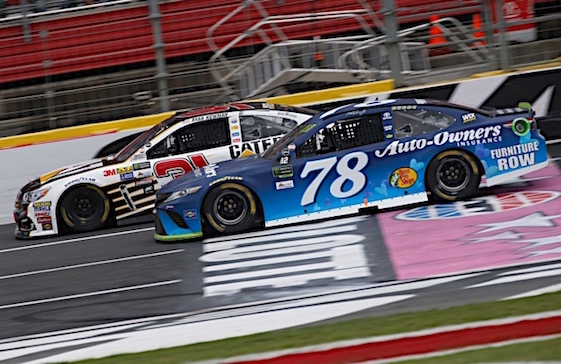 Truex survived a pair of late-race restarts and an overtime finish to secure his sixth victory of the season, his second at the 1.5-mile track, his second of the Playoffs and the 13th of his career. The win moves Truex into the next three-race elimination series, the Round of 8. He leads the postseason standings. Chase Elliott took second place in the Hendrick Motorsports No. 24 Chevrolet. He led 12 laps and finished .911 seconds behind Truex at the checkered flag. The runner-up finish was Elliott’s second in a row. “We needed to be a little better I think in the middle stage and not lose so much track position,” Elliott said. “That was where Martin (Truex, Jr.) came on and got his track position and we lost ours and it was just hard to get all of it back there toward the end. Kevin Harvick led four times for a race-high 149 laps in the Stewart-Haas Racing No. 4 Ford and took third place. Denny Hamlin and Jamie McMurray completed a top-five sweep by postseason-eligible drivers. Kyle Larson led 12 laps and salvaged a 10th-place finish despite a sluggish pit stop during a late caution period. Larson also rallied from overshooting his pit box during the first flurry of stops, an error that dropped him outside the top 30 in the running order. He also pressed on after a left-rear tire rub from late-race contact with Kurt Busch. Jimmie Johnson also hit pit-road trouble late in the race, briefly leaving his pit stall before the left-front tire was properly fastened. He recovered to bring the Hendrick Motorsports No. 48 to a seventh-place finish. Kyle Busch, who won two of the three stages of the first round of the Playoffs, had rough afternoon in the heat and humidity of North Carolina. He bounced off walls a couple of times and then after the race, got out of his car and had to lie down and wait for medical personnel. The problem was reportedly heat related. The series’ next race is scheduled next Sunday at Talladega Superspeedway (2 p.m. ET, NBC, MRN, SiriusXM NASCAR Radio), the final restrictor-plate track on the schedule. (17) Martin Truex Jr (P), Toyota, 337. (7) Chase Elliott (P), Chevrolet, 337. (3) Kevin Harvick (P), Ford, 337. (1) Denny Hamlin (P), Toyota, 337. (18) Jamie McMurray (P), Chevrolet, 337. (14) Daniel Suarez #, Toyota, 337. (25) Jimmie Johnson (P), Chevrolet, 337. (15) Ryan Blaney (P), Ford, 337. (9) Kasey Kahne, Chevrolet, 337. (10) Kyle Larson (P), Chevrolet, 337. (2) Matt Kenseth (P), Toyota, 337. (23) Dale Earnhardt Jr., Chevrolet, 337. (22) Ricky Stenhouse Jr. (P), Ford, 337. (26) Trevor Bayne, Ford, 337. (6) Brad Keselowski (P), Ford, 337. (13) Austin Dillon, Chevrolet, 337. (38) Erik Jones #, Toyota, 337. (21) Chris Buescher, Chevrolet, 337. (20) Paul Menard, Chevrolet, 337. (19) AJ Allmendinger, Chevrolet, 337. (27) Ty Dillon #, Chevrolet, 337. (8) Kurt Busch, Ford, 337. (29) Matt DiBenedetto, Ford, 337. (24) Aric Almirola, Ford, 337. (30) Landon Cassill, Ford, 336. (28) Joey Logano, Ford, 335. (5) Clint Bowyer, Ford, 335. (39) Corey LaJoie #, Toyota, 333. (4) Kyle Busch (P), Toyota, 331. (37) Jeffrey Earnhardt, Chevrolet, 330. (34) Reed Sorenson, Chevrolet, 330. (33) * BJ McLeod(i), Chevrolet, 326. (36) * Timmy Hill(i), Chevrolet, 326. (32) Cole Whitt, Chevrolet, 295. (16) Michael McDowell, Chevrolet, 293. (35) * Gray Gaulding #, Toyota, 267. (31) David Ragan, Ford, Accident, 263. (12) Danica Patrick, Ford, Accident, 263. (40) * Brett Moffitt(i), Toyota, Accident, 89. (11) Ryan Newman, Chevrolet, Accident, 43.